FACT: People who read are more likely to get ahead when it comes to their careers, and life in general. With over twenty years in global business, I know how hard it can be to find relevant content and information that is actually helpful to you in your career. 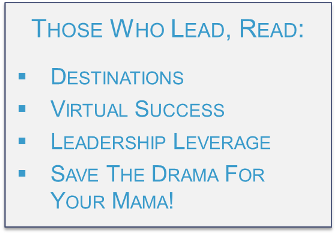 There is a sea of information out there and my goal, through my books and my blog, is to provide you with practical, relevant leadership information that you can use every day to help you become not just a good leader – but a great one! My sincere hope is that you will find the leadership information contained here to be useful in moving your career forward in very significant ways. Please take a few moments to read the summary for each book and consider how they will impact your career… and your life. This page provides an overview of my books, along with additional information that will be of value to you. Click on the links below to take you directly to the relevant sections.